This article is about the land of Subcon. For the fairy-like folk named Subcon, see Subcon (species). For the stage "Mushroom Kingdom II" which takes place in Subcon from Super Smash Bros. Melee, see Mushroom Kingdom II. Subcon (alternatively Sub-con or Sub-Con; also known as the World of Dreams) is a peaceful dream world of the Subcons. Believed to be Mario's dream, it is said to be a vast dream world that is part of a larger subconsciousness of the Mushroom Kingdom's inhabitants. The name "Subcon" itself is short for "subconscious". In Yume Kōjō: Doki Doki Panic, Subcon was in a storybook that the twin children Poki & Piki get pulled in by Wart. In fact, the reason Chapter 7 is only two pages is due to the fact that the original ending was accidentally destroyed. This detail is lost in the Mario version of the game's events. Subcon is the main setting of the game Super Mario Bros. 2, where the world was first available. Subcon was once a peaceful place until it was taken over by the tyrannical Wart. He created monsters with the Dream Machine, and sent his army from the dream factory all around the land. The original inhabitants of Subcon were captured and imprisoned so that they would not interfere with his mischief. From their confinement, the Subcons sent a message to the hero of the nearby Mushroom Kingdom, Mario, to come and free them. At first Mario thought the message was just a dream, but the next day, while on a picnic with Luigi, Toad, and Princess Toadstool, he discovered a cave that led him to the very world he saw in his dream. Mario and his friends instantly set out to free them and defeat Wart to free Subcon from his reign. They battled their way through Wart's army, the 8 bits, as well as Birdo, Mouser, Tryclyde, Fryguy, and Clawgrip. In the end they faced Wart himself, and were eventually able to defeat him and free the captive people. Mario then briefly awakened in his bed, and soon went back to sleep. Subcon is again the main setting of the pseudo-sequel of Super Mario Bros. 2 for Satellaview, BS Super Mario USA. 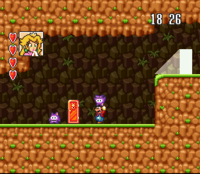 This game appears to depict Subcon as a realm of dreams, rather than an actual dream like the ending of Super Mario Bros. 2 implies, and explains that after his defeat, Wart and the 8 bits went into hiding in another dream for a short while. However, they soon return, and the king of Subcon is forced to use Star power to call Mario and the others back to Subcon to stop Wart once again. Mario, Luigi, Toad and Princess Toadstool were able to defeat Wart and his crew once more, thus returning peace to Subcon and its inhabitants. In the Super Mario Advance remake of Super Mario Bros. 2, there were now Yoshi Eggs scattered all around Subcon, which Mario and friends has to recuperate. Besides that, the game's depiction of Subcon is the same as in the original. Subcon made its first Super Smash Bros. series appearance in Super Smash Bros. Melee, as a stage called Mushroom Kingdom II, which is based on World 1-1 and 1-2 of Super Mario Bros. 2. Mushroom Kingdom II is the second Mushroom Kingdom stage in Super Smash Bros. Melee. It can be unlocked by collecting the Birdo or the Pidgit trophy. 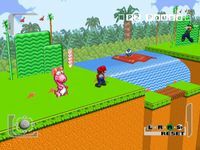 Unlike the first Mushroom Kingdom stage, Subcon is based on its appearance in Super Mario All-Stars and BS Super Mario USA. This stage doesn't take place in the Mushroom Kingdom, despite the name. Luigi is also fought here before he is unlocked. Subcon returns as a playable stage in Super Smash Bros. Ultimate. Plants stick out throughout Subcon, which, when pulled, will give the character a vegetable, 1-Up Mushroom, POW Block, or, occasionally, a Bob-Omb. A lot of the region of Subcon is high in the sky, as clouds would be considered "land". The dream world has many moons at night as first seen in Super Mario All-Stars. Subcon also has many recurring landscapes, such as grasslands, deserts with pyramids, snowy islands, and others. The only castle structure is Wart's factory, and no towns or cities are seen throughout the game. Super Mario All-Stars added jungle trees (Worlds 1, 3 & 5), mountains and Egyptian palaces in the desert distance (Worlds 2 & 6) and floating Greek-style temples (World 7) as background objects. According to BS Super Mario USA, Subcon has a kingdom and a king. It is not known how much of Subcon is considered a true kingdom; if not the entirety of the dream world, seventh world in the clouds of Subcon above the grass or the desert region is probably the whole region of the kingdom itself. The factory from World 7-2 is actually the king's castle. Subcon also uses Coins, though their design is different, with an "I" in place of the "1" on the Mushroom Kingdom's coins. Coins in this world are rather rare. Instead of being found floating in the air or in blocks like in the Mushroom Kingdom, Coins could only be retrieved by using a Magical Potion to go to Subspace, where unpicked grass gives coins in place of items (said grass still remains after leaving Subspace). Coins are used to earn extra lives in a minigame after finishing a level. Subcon's natural population consists of mostly Subcons, although the seldom-seen king and his aide appear to be human. During Wart's takeover, several monsters were artificially created, although some existing creatures like Albatoss and Tryclyde were merely enlisted to his forces. Other creatures resembling those from the real world are also known to exist, such as whales and snowmen residing in icy territory. In the Nintendo Adventure Book Dinosaur Dilemma, the text describes Wart as "the king of the Land of Nightmares", presumably referring to either Subcon or a similar realm. ↑ Super Mario Bros. 2 NES instruction booklet, page 3. ↑ 2.0 2.1 Nintendo Power Volume 1, page 6. ↑ Nintendo Power Volume 2, page 42. ↑ Yume Kōjō: Doki Doki Panic instruction booklet, page 6. This page was last edited on March 22, 2019, at 22:58.